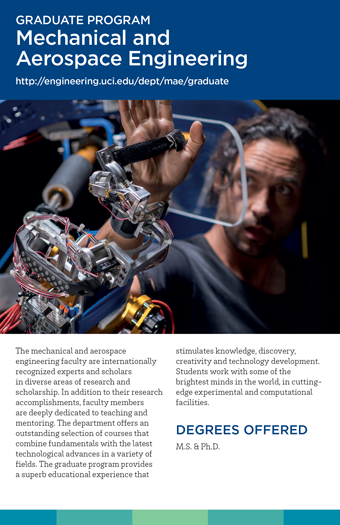 The Mechanical and Aerospace Engineering faculty are internationally recognized experts and scholars in diverse research areas: Biomechanical Engineering; Design and Manufacturing; Dynamics, Controls and Robotics; Energy and Environment; Fluid Mechanics and Aerodynamics; Mechanics of Solids, Structures and Materials; Microsystems and Nanomaterials; and Power and Propulsion. Biomechanical engineering integrates physiology with engineering in order to develop innovative devices and algorithms for medical diagnosis and treatment. Areas of activity include biorobotics, neuromuscular control, rehabilitation, cardiovascular mechanics and respiratory fluid mechanics. Research in design engineering involves the development of methodologies to address issues ranging from defining the size and shape of components needed for force and motion specifications, to characterizing performance in terms of design parameters, cost and complexity. Applications include automotive and aerospace systems. Research in subtractive and additive manufacturing focuses on enhancing the state of the art in microfabrication. Research is conducted in the areas of dynamic systems optimization and control, robotics and machine learning. Advanced concepts in dynamics, optimization and control are applied to the areas of biorobotics, flight trajectory design, guidance and navigation, learning systems, micro sensors and actuators, flexible structures, combustion and fuel cells. The focus of robotics and machine learning is the creation of machines with human-like intelligence capabilities for learning. Cooperative robotics includes the development of distributed algorithm design for multi-agent systems. Research in this area encompasses combustion, fuel-cell technologies, and atmospheric physics and impacts. The topic of combustion addresses the fundamental fluid-dynamical, heat-transfer and chemical mechanisms governing combustion in diverse settings. Fuel-cell research encompasses the development of fuel-cell technology, hybrid engines and thermionic devices. Activities cover the thermodynamics of energy systems, the controls associated with advanced energy systems and systems analyses. The area of atmospheric physics and impacts comprises the modeling and controlling of chemical pollution, particle dispersion and noise emission caused by energy-generation and propulsion devices. Research in this area includes incompressible and compressible turbulent flows, multiphase flows, chemically reacting and other nonequilibrium flows, turbomachinery, electrosprays, aeroelasticity, aerodynamic optimization and aeroacoustics. Computational approaches include direct numerical simulation and large-eddy simulation; laboratories include wind tunnels and high-speed jet facilities. This field emphasizes analytical, computational and experimental approaches that contribute to a basic understanding of and new insight into the properties and behavior of condensed matter and engineered materials. General areas of interest are large-strain and large-rotation inelastic solids, constitutive modeling and fracture mechanics. Computational algorithms center on boundary-element methods and the new class of meshless methods. Studies in structural mechanics involve the analysis and synthesis of low-mass structures, smart structures and engineered materials, with emphasis on stiffness, stability, toughness, damage-tolerance, longevity, optimal life-cycle costs and self-adaptivity. This area encompasses miniaturization engineering, micro-mechatronics and advanced nanomaterials. Miniaturization engineering is relevant to the development of small-scale mechanical, chemical and biological systems for applications in biotechnology, automotive, robotic and alternative energy applications. Mechatronic design focuses on the design, modeling and characterization of micro-electro-mechanical systems (MEMS). Research on nanomaterials focuses on uncovering new structure-property relationships for next-generation structural, electronic and energy components. Research in this area encompasses aerospace propulsion and its environmental impacts, combustion and thermophysics. In aerospace propulsion, particular emphasis is placed on turbomachinery, spray combustion, combustion instability, innovative engine cycles, colloidal propulsion, compressible turbulent mixing and noise emissions. The topic of combustion and thermophysics addresses the fundamental fluid-dynamical, heat-transfer and chemical mechanisms governing combustion in diverse settings. Official transcripts should be sent to the graduate coordinator if you are accepted into the program.